I’ve said it a million times it feels like since the election, things have only gotten darker. Thankfully artists in hip-hop have taken a multitude of approaches to this, some like Chance the Rapper and Mikeyy Austin go against the grain to spread positivity. Others prefer to use these dark times to reflect and analyze the world in front of them. A.L. 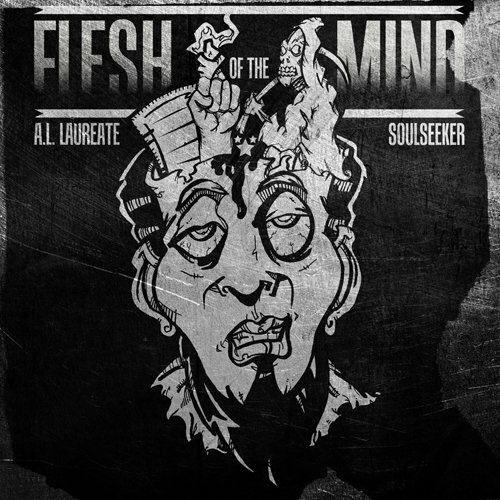 Laureate and Soulseeker choose the latter as the duo Flesh of the Mind, and today I have a review of their self-titled album. Off top this is a dark album, there’s no ifs, ands or buts about it, this album is dark, both SoulSeeker and A.L both go into some deep personal subjects. There’s a loose theme throughout the EP of the end of days and at points on the EP the duo almost make it seem like they’re a part of this post-apocalyptic world they’ve created here. Numerous times on the project the two touch on the idea of the end of the world, or a world where politicians have successfully brainwashed the nation making us robots, lacking creativity. Flesh of the Mind though permeates with creativity, Soulseeker’s production really puts you in the dark, depressing mood that matches the lyricism of Flesh of the Mind. It’s never repetitive either, Soulseeker’s atmospheric and downtrodden beats do enough to switch up the sounds making the EP a diverse experience. Duos are a lost art in hip-hop (let alone collaboration but that’s for another time), Soulseeker and A.L have crafted a nice niche EP with this. It’s not going to be for everyone, everything from the production to the lyrics of our heroes are drenched in darkness and a lack of hope. People like me who spend dark nights thinking too much love this type of music, but it isn’t for everyone. I pray we get a full-length from Flesh of the Mind next year, their approach to the music is different from what we’re used to, challenging, provoking thought not afraid of what lies beyond the shadows.